Background: It is important to study about the use of natural antioxidants as alternatives to synthetic ones due to the possibility of carcinogenic effects of synthetic antioxidants. This study is comparing the effect of the ultrasound-assisted and maceration extraction methods on antioxidant activity of Matricaria recutita. Methods: Bioactive compounds including phenolic, tocopherol, flavonoid and tannins and antioxidant activity of the extracts were evaluated. Moreover, extracts obtained from ultrasound and maceration methods were added to sunflower oil without any antioxidants at level of 200, 500 and 800 ppm, after that samples were heated at 180°C. Oxidation of the samples were evaluated after 0, 4, 8, 12, 16, 20 and 24 hours by measuring Peroxide Value (PV), Conjugated Diene (CD), Iodine Value (IV), Carbonyl Value (CV), Total Polar Compounds (TPC), Oil Stability Index (OSI), Color Index (CI) and acid value (AV). Results: The result showed total phenol (42.90 mg gallic acid/g extract), tocopherol (120.46 µg α - tocopherol/ml extract), flavonoid (2.64 mg/100 g extract) and tannins (3.89 mg gallic acid/g extract) of ultrasound extracts were higher than maceration extracts. Antioxidant activity of the extract was evaluated by DPPH assay which indicated 800 ppm of the Matricaria recutita extracted by ultrasound was the highest radical scavenging ability. Conclusion: Result indicated both ultrasound and maceration extracts could increase the oil oxidative stability but could not increase compared to BHA. 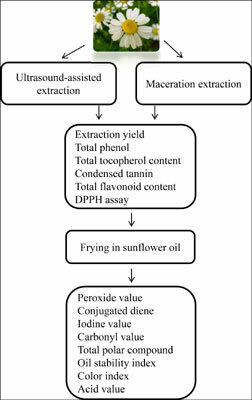 In most cases, the extract samples by ultrasound had a better effect on stabilizing of sunflower oil during frying. Antioxidant, Bioactive compounds, Maceration, Matricaria recutita, Sunflower oil, Ultrasound.